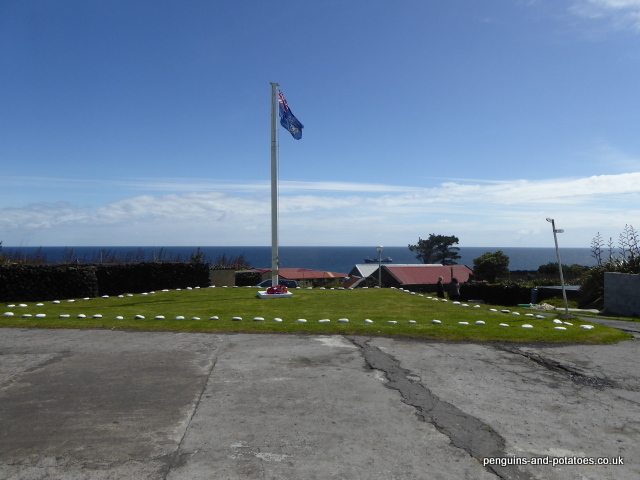 It would be easy to look at Tristan da Cunha from the outside, and to think “Not much can happen there”. That assumption would be easy – and entirely incorrect! Partly because of the difficulty of getting people and goods on and off the island, it is a busy place! Some details of a recent one week period might illustrate how busy it can be. On Monday, after a passage of nine days, we had the arrival of the Baltic Trader. This ship has been very well known on Tristan for a number of years, but this time she arrived here for her last ever voyage to the island, having been sold to a buyer in the northern hemisphere – an old boat resplendent in her new paint! The Baltic Trader was commissioned to do one extra trip to Tristan; she carried over 800 tonnes of freight, two new bulls, one new puppy, and a French visitor from the tiny island of Ushant. The arrival of the bulls was the culmination of nearly a year’s work. Although we carried out a cattle breeding AI programme at the beginning of this year, it will be about two years before any bull calf bred from this programme will be old enough to take on their breeding duties with the island herd. The existing bulls on the island have been here for too long, and the percentage risk of inbreeding increases with every year. So we brought in two new Aberdeen Angus bulls from South Africa. The new bulls travelled in a specially modified shipping container. Nine days at sea, which included some quite rough weather, must have been quite unsettling for them, but nothing to compare with the experience of coming ashore, when in worsening conditions on Monday afternoon they were craned off the ship and onto the raft, then in the harbour they were craned off the raft and onto the awaiting lorry, and finally they were craned off the lorry and placed in their initial field. They emerged from the container suffering from the effects of their sea voyage, and one in particular was quite bad tempered. 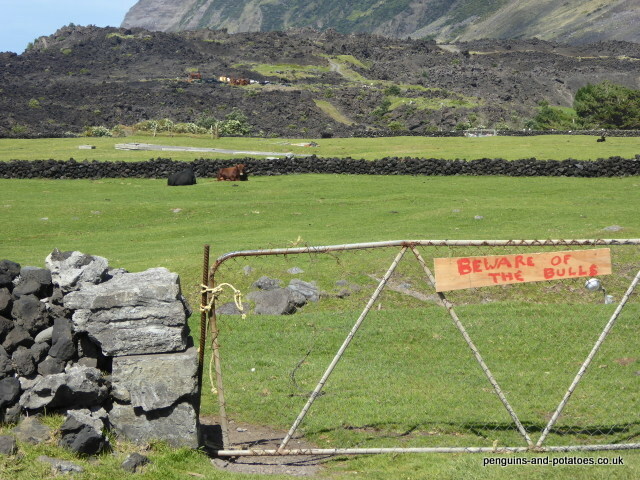 We put a “Beware of the bulls” sign on the gate, and notices up on all the boards urging people to be very careful until the bulls were more settled. On Tuesday, wind conditions had picked up and there was too much swell coming into the harbour for unloading to continue. Bee had offered to take the Man from Ushant for a walk, to help get rid of his ‘cabin fever’. 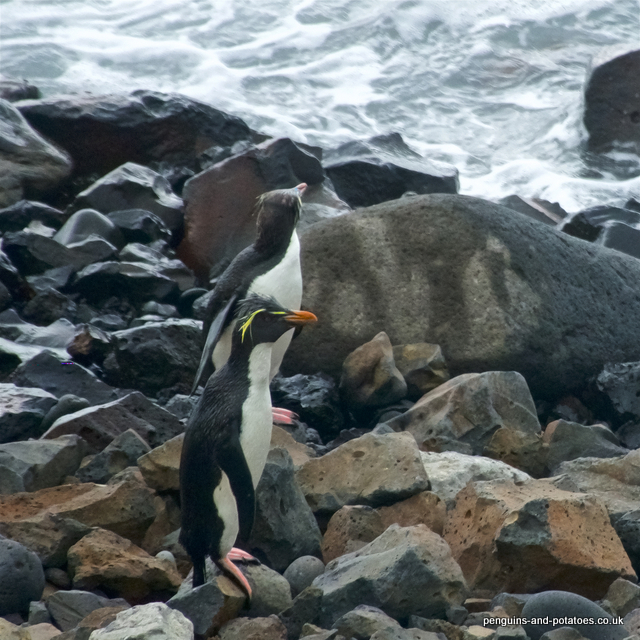 They went to Pigbite, and on the way back they saw a number of South Atlantic Fur Seals and they visited the nest of a Northern Rockhopper penguin, with chick. They were quite close to the Harbour when they saw two unusual looking penguins coming ashore. Some very good pictures were taken of these new arrivals, and we had a measure of excitement while they were identified. First opinions suggested Macaroni Penguins, which are in the Field Guide of Tristan as being rare occasional visitors. This opinion, from world penguin experts, evolved to them being Southern Rockhoppers, which was massively exciting because these have never before been seen on Tristan. But – the excitement was short-lived, they were eventually identified as being sub-adult Northern Rockhoppers! There was some excitement also on Tuesday with the superyacht Enigma, which passed close to Tristan on her way from Cape Town to Brazil. On Wednesday, routine work resumed because the harbour remained inaccessible. One task undertaken by a Public Works team was the smartening up of the flagpole area outside the Prince Philip Hall – the grass was cut, the stones marking the border were painted and re-aligned, and all looked great ready for the eleventh hour of the eleventh day of the eleventh month, in three days time. 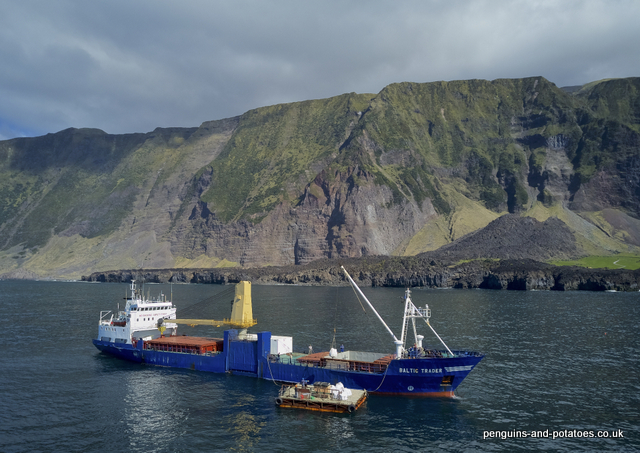 On Thursday morning, Tristan da Cunha was once again made famous on the world stage. Three schoolgirls had left the island a couple of months earlier to attend a school in England to do their A-Levels. The girls had a day off from their studies to attend the British Museum, where they were interviewed by the BBC on the 200-year anniversary of the signing of William Glass’ main constitutional paper, called the Constitutional Agreement. The girls managed extraordinarily well in front the cameras, and the whole island was hugely proud to see their children represent Tristan so competently and with such charm when the piece was screened on Breakfast Today. The weather conditions had greatly improved. Because the ship was carrying so much cargo, and because the weather forecast looked to be bad from Tuesday onwards, unloading was started, and a fishing day was also declared. It is quite unusual for unloading and fishing to be done on the same day. But – with 800 tonnes of cargo to unload from the ship and a worsening weather forecast for after the weekend, together with the need to catch up on what has been a poor fishing season because of months of bad weather, the difficult decision to run both operations was made. On Thursday evening, the factory siren sounded and Bee went down as usual to join the team of ladies who work on the processing of the crayfish. Always on fishing days there is a long evening shift to start the process of handling the crayfish, and this process is generally continued in long shifts on the following two or three days. It is a very busy time for over twenty of the island ladies (and Bee), many of whom are pensioners. On Friday, there was no fishing, but the unloading operation went ahead at full speed. For the most part, the cargo being unloaded was general cargo, such as crated supplies for the Island Store. This was exciting – it also included supplies from the UK. Unloading is generally an ‘all hands day’, – all able-bodied people join in the task of bringing the cargo up from the harbour, unpacking it from the crates, and taking part on a chain of bodies to get the things stacked in the store behind the shop. In the case of the goods from the UK, packages of all shapes and sizes were placed in separate piles for individuals and for Departments. These were all measured and signed for, in order for the shipping costs to be apportioned. The unloading team worked right on until after 7.30 that night. We ourselves received two boxes of things sent by family members in the UK, as well as a new battery for my VHF radio and a DVD course in Excel – all items much needed and eagerly awaited! We also received a consignment of vegetable seeds from the UK – which were of such high priority that many of them were sown in the greenhouse the following day. The unloading operation continued on the Saturday, largely bringing in load after load of building materials for the construction of Dolosses, those concrete structures that are used for harbour wall protection around the world. 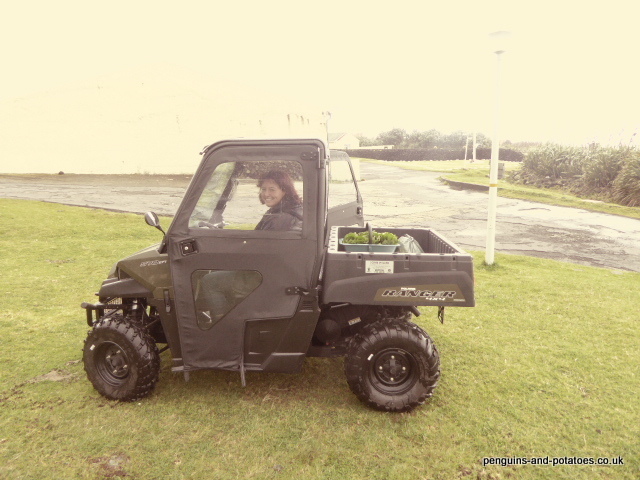 Then there was news that we were waiting for – the Agriculture Department’s new Polaris Ranger was on a raft coming from the ship. This vehicle had taken nearly nine months to arrive from the UK, thanks partly to some obstructions from Customs in Cape Town. On Sunday, there was a Remberance Service in the Catholic church – the two churches hold this service in alternate years. Some of the school children had gone round the houses in the previous days, collecting flowers for the making of a wonderful community-effort wreath. At the same time, in the race against the arrival of the bad weather, unloading continued throughout Sunday, and the ship was finally empty by Sunday night. On Monday, there was activity everywhere as a result of the events of the last few days. In the shop, a mountain of goods had to be sorted and shelved, and the shop itself was closed from 10.00 in the morning so that staff could get the place sorted out. I took advantage of the calm weather to check and underseal the new Polaris, to help protect it from the very corrosive atmosphere. Backloading of the ship took place as quickly as possible, the factory cold stores being emptied of many tons of packed, frozen crayfish, destined for markets in Europe, Japan and Australia. Sometimes, just sometimes, things go better than anticipated, and at very short notice it was announced that the Baltic Trader was to leave in fifteen minutes time! At 12.00 the Harbour saw our friend from Ushant sharing last-minute photographs from his laptop, and one of the Post Office staff desperately sellotaping up packages to get them into a post bag and onto the raft, before the raft left two minutes later. One casualty of the fact that everyone was very fully occupied on Friday, was that an important Island Council meeting had to be postponed. The crucially important issue on the agenda was the question of reducing cattle numbers, in order to take control of the overgrazing on the island. It was my job to be fully prepared for this meeting, but I had to wait for the re-arranged meeting for it to be discussed and decided upon. Because of this, I will keep my readers waiting for the eventual news on this major issue! Later that day I came back into our house to find firstly that we had a working WiFi, for the first time in about two months, and secondly to find a big bag of eggs that had been dropped off for us – the next job was to find out who had kindly delivered the eggs! After a week of intense activity, the normal routines of daily life resumed. For the busy Tristan islanders, it was good to have time to be able to go back to tending their potato patches and doing the many odd jobs that come up on a daily basis, in addition to their Government jobs. Great description, thanks. When we were there everything had to be unloaded into the longboats and rowed ashore to Big Beach, where the original canning factory is now buried under the lava. Hope you got the decision you wanted! Tricky one, with people apportioned a certain number of animals per family! All the best for 2018. Have tried Barbara’s new email address with no sucess! Hope all is well with you both. Jane & Ian. I was on Tristan as a child just after they went back. My dad (Alan Hemming)was postmaster and radio operator I have amazing memories and often think it would be great to go back for a visit. your video made me homesick. Im currently a mature student doing a sculpture degree. I’m working on an installation for my degree using my time on Tristan for inspiration. I found your site while looking for a first sight picture to use in this and wondered if I could use yours. I wont be making any money from this and wont be reproducing the image for anything else. I will credit you for the picture and put a link to your blog in my video which will be part of the installation. Its a great view of island life now . No problem if you would rather I didn’t use the photo I felt it was right to ask.